Air purifiers are generally an expensive item, where quality models can cost several hundred and sometimes over a thousand dollars, and for good reason. First of all, despite the fact that some models are more precise in the toxic contaminants that they neutralize and eliminate from the air, or the different methods, whether filters, photocatalytic or other technologies, there’s typically one common denominator. No matter the inherent benefit and quality of each model, they’re designed to purify an entire room and are capable of purifying areas of varying sizes. This is one area where the Wynd promises to provide some unique advantages, in that it’s designed to purify a personal space via smart technology. We’ll break down how that actually works and what its true benefits are further in this review. Because of this, there’s also an inherent cost savings due to the fact that it’s a compact model, however there are many assumed constraints to this and we’ll discover how well Wynd overcomes those as well. One of the completely unique components that the Wynd has is its own tracking system, which provides a variety of functions. For starters, it’s capable of tracking your position in the room, which is particularly useful for two advanced features that make it a high performance personal unit overall, but certainly no match for industrial models. 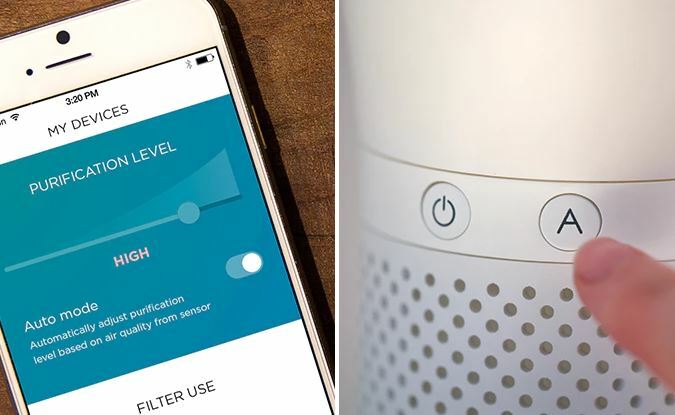 Rather than targeting the entire expanse of a room, including under couches and on surfaces like drapes and book shelves, it will track the overall pollution level in the room. One of the advantages to this, is that it can tell which areas contain a higher concentration of potentially more dangerous contaminants, and can target the highest priority area for purification. It can also detect where you are in the room. Rather than waiting for the entire area to slowly become cleaner, it’ll push out a funnel shaped output of clean air in your general direction, so that you can breathe easy right away. Next, because it can focus its utilities and clean all of the air immediately around you, it’s much more effective to have a clear picture of where you are. The tracking unit can actually either be attached directly to the purifier component, or because it’s so small, can be attached to your clothing or elsewhere on the outside of your body, and use data within your immediate vicinity. 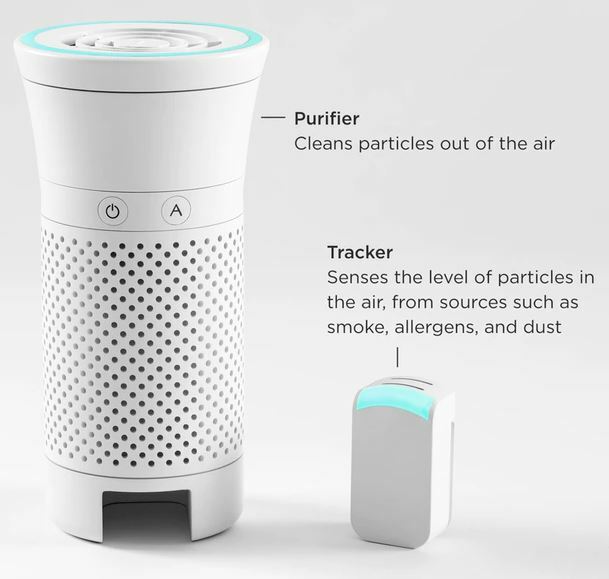 This way, it’s also capable of targeting the most harmful and highly concentrated contaminants, because it’s so close in range to what it’s monitoring – and it’s easier for Wynd to track the air around you while you’re in motion. In terms of specific performance values, the Wynd Air Quality Tracker is comparable to a much larger model called the TSI DustTrak that costs roughly $5,000. Both models delivered correlation values of 99%. Conventionally, an air purifier can take up a lot of space and be very heavy. With that being said, there are smaller models that use photocatalytic technology which can remove contaminants from an entire room much more effectively. These technologies, however, require a lot of design ingenuity and technical expertise, so cost effective, quality models are few and far between. They’re certainly not the popular models that are heavily branded within the market. Wynd actually offers a little of the best of both worlds in this case. For one, it’s much smaller than any other model in its class, with the exception of super fine purification capabilities as well as the rapidity and consistency with which it operates within an entire room. We’ve already mentioned some of its tracking and mobile capabilities, however it’s worth mentioning that its size provides a significant advantage. First, it’s much easier to travel with as it can fit in storage areas as small as a purse, and it’s actually designed to take with you wherever you go. There’s also a microfiber carrying case provided in the basic package in case you’d like to grab it on the go. 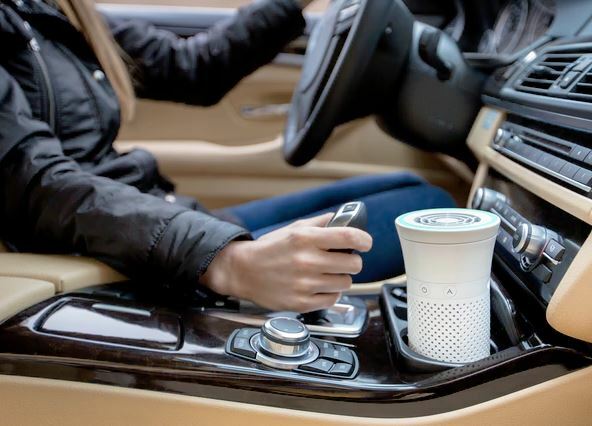 This is made possible not only by its smart ability to track and focus on particular areas and particles independently, but also because you can fit it in your coffee holder. Although it’s capable of continuous use, there aren’t any major interruptions in service when it’s moved from one location to another. Based on laboratory tests, Wynd Technologies has discovered that it will remove about 50% of fine particles, and about 70% of coarse particles in compact areas like a vehicle within 10 minutes of operation. There’s also a kickstand that comes out of the box so that you can position it at an angle on a hard, flat surface. This remains the big performance question, because filters can be radically different in their ability remove contaminants, either because they specifically focus on allergens, or because they’re flat-out inferior. Wynd’s filter is made of electrostatic material and is capable of filtering particles as small as 0.3um, which is about 98.5% of all materials larger than one micron in size. 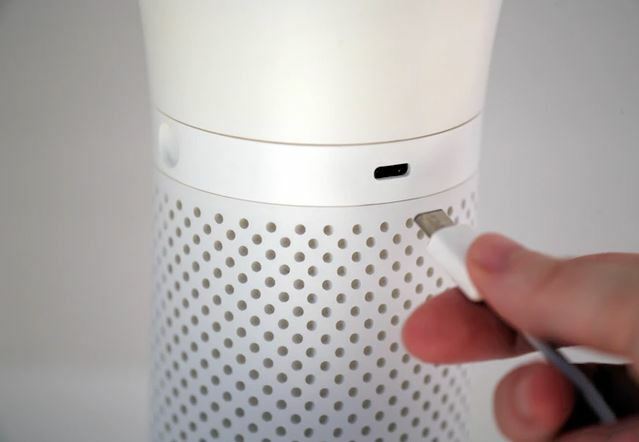 It actually has a 100% efficiency rating for removing pollutants greater than 3 microns in size, based on a test by the FITI Testing and Research Institute. 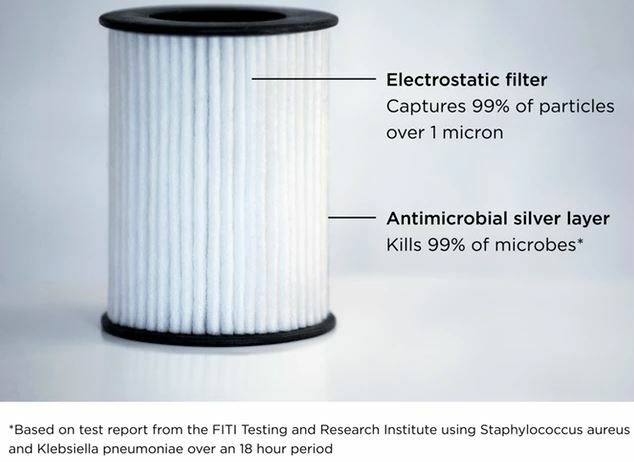 There’s also an antimicrobial silver layer on the filter, which is important, because as air passes through it’ll kill of germs that are left behind before the clean air flows into your room. These two features combined make it a medical-grade filter. 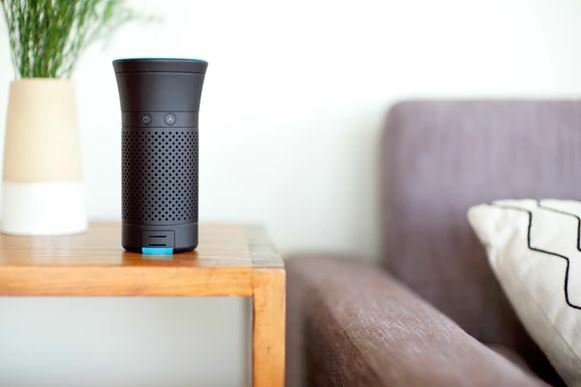 In terms of air flow, Wynd has been specially designed by a prominent aerospace engineer who is responsible for its ability to funnel air around you. This is certainly no cheap gimmick. The other real mentionable quality of the filters designed for it is the fact that you can replace them for about $7 each, which is an enormous cost savings, considering that it will last for 3 months in heavily polluted environments. There are a ton of unique and interesting features to mention in this section, and it’s a good Segway into mentioning that Wynd is capable of telling you the status of your filter, as well as when you should replace it, based on its own tracking. There’s also an auto-ship program available for the filters, which combined with its ability to regulate its own condition means that they can automatically charge you for a new one and ship it to your door by the time you’re required to replace it. Next, there’s a companion smart phone app available for iOS and Android, which can provide key insights, even in dynamic situations. 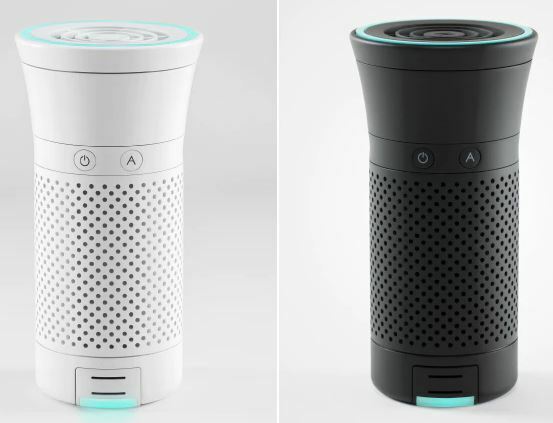 For one, there’s an LED ring on top of the Wynd purification unit that’s color coded to tell you the status of the air around you, however you can get detailed information very quickly via the app as well, including smart alerts to the device of your choice when the air condition deserves your attention. 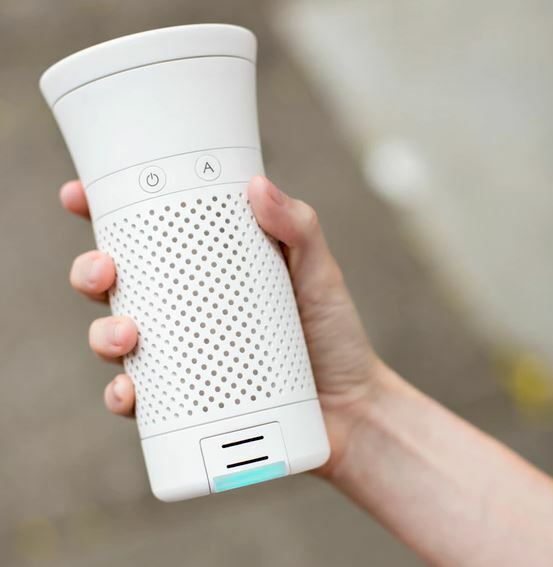 Because Wynd can potentially track a tremendous amount of local data from its users about the precise air quality level in their surroundings, there are significant insights and potential advancements available as well. For example, the app will display the general condition and a numerical rating for the amount of pollutants both indoors and outdoors, and it’s all in real time. It’ll also display and graph out daily totals of the amount of contaminants that it’s removed, as well as provide information on the air quality of users within your network. This could potentially develop into a worldwide network of areas that use Wynd and are willing to display their air quality before you visit those areas. Many air purifiers have three basic power modes, which are typically manually set and include low, medium and high. Wynd, on the other hand, provides power options all the way from 0 to 100 in increments of 1. There’s also an automatic mode, which will dynamically manage the power consumption based on what’s required to target contaminants and keep a room clean over time. We’ve mentioned the filter requirements which are conservative, and although it’s not surprising that an air purifier of its size would be low maintenance in this area, even despite its high overall performance, there are other aspects to consider. First, because Wynd is portable there is inevitably a battery requirement in order to operate continuously at full functionality. One of the newer technologies that it uses that the rest of the mobile electronics market is beginning to catch on to, is the use of a type-C USB cable for charging. The reason it’s taken so long for this update in a relatively simple component is that allows for greater electrical transfer, and allows Wynd to fully charge its battery within 4 hours for a full day’s worth of use. This is certainly a good example of how smart technology can be used to make our current industrial accomplishments much more powerful and effective, at less expense to the consumer. Wynd Industries is planning a variety of deals, such as family packs at slightly discounted prices, as it rolls out its wide scale marketing campaign. If you test it and like it, there are certainly economic opportunities to use it on a wide scale basis.